If your stomach bursts, don't say we didn't warn you. An ugly backlash to the healthy food movement has a special place on the 'Net that's sure to throw your appetite for a loop. It's called This is Why You're Fat and it is a big hit because, even online, people just seem to have an appetite for over indulging. The site's creators say they get more than 100 submissions a day and more than three million page views a month. The Hurler Burger, deep fried Spam sticks and the Bacone are just a few of the treats on the menu where people are asked to snap pictures of culinary freaks of nature and submit them to for all the world to see. Some of the creations are actually served in restaurants, others are homemade. 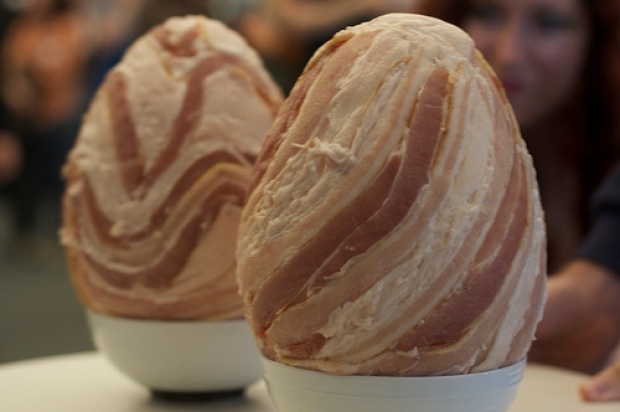 Take the Bacone, for example. The cone-shaped deep-fried wonder filled with scrambled eggs, hash browns, gravy and topped with a biscuit found its way to the site but has already made a name for itself outside its creator's home. Christian Williams of San Mateo invented the Bacone, well, just because he likes "making stuff." "I'm not a gluttonous eater kind of guy," Williams chuckles. But the Bacone became much more than just a deep-fried dream that never left the San Mateo man's kitchen. The messy handheld meal won the judges' choice award at BaconCamp, a gathering for lovers of the porky snack. Simply put, the Bacone is "Kind of like a breakfast ice cream cone without the sugar high," Gourmet magazineRobert Ashley described. We assume, however, that there is a cholesterol high. Ashley peels away the fat and gets to the bottom of America's obsession with the greasy, sweet and just downright disgusting love for all things unhealthy in a trend he dubbed the Gross-Food Movement. 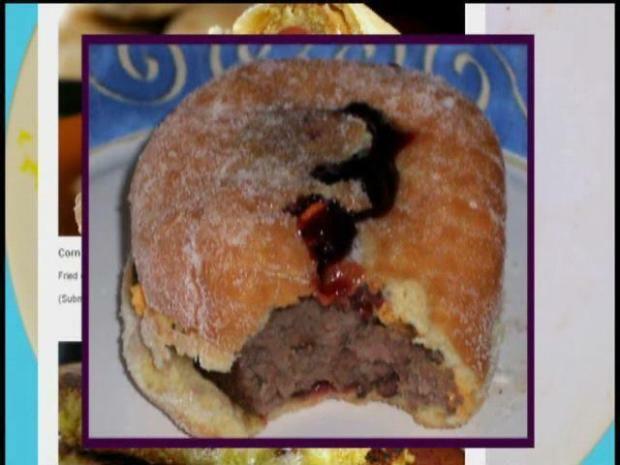 The Hurler Burger, deep-fried Spam sticks and the Bacone are just a few of the treats featured on a Web site that shows off America's obsession with gross food. It all boils down to a lack of identity, Ashley believes. "I think that Americans suffer from having no native food culture." Ashley says. "I think we're always coming up with these new bizarre trends and think that's part of what created this." Whatever the reason for the downward slide into the greasy abyss of unhealthiness, the site proves there will always be an audience for ugly food. The next stop for This is Why You're Fat is the coffee table -- the site's creators are taking the dishes to old media in the form of a book that's slated to come out next October.